Berry Vodka Cocktails are quick to make with only a few ingredients. You don’t even need a shaker. And these festive summer drinks sugar-free. While I’m not much of a drinker, I do enjoy a delicious cocktail on holidays and special occasions. And the prettier the drink, the better! I’m particularly fond of fruity beverages that are naturally sweetened. That’s why I decided to create these gorgeous summery berry vodka cocktails. The inspiration for Berry Vodka Cocktails was the festive red, white, and blue Absolut America vodka bottle I picked up. And I was so excited to use this spirit in my recipe when I found out that Absolut’s National Charity Partner this summer is Keep America Beautiful. Plus they are committed to donating $100,000! If you’re not familiar with this organization, they work to end littering, improve recycling, and beautify communities. All you need to do is upload or share on social media a photo showing how you “party with a purpose,” and Absolut will donate $1 to Keep America Beautiful. Be sure to use the hashtag #AbsolutAmerica. 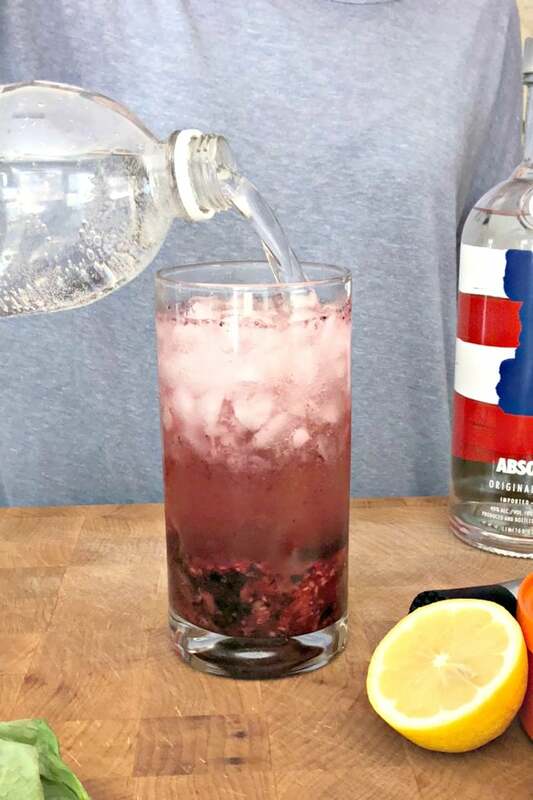 You can share your version of a berry vodka cocktail, or try a featured Absolut recipe. Another easy one to make is an Absolut Lemonade/Iced Tea. Just combine 1.5 parts vodka, 2 parts lemonade, 2 parts iced tea, and garnish with a lime. I also like that Absolut contains no artificial ingredients. In addition, in certain states, you’ll find a $2.00 save now coupon or a $3.00 mail in rebate on one 750 ml bottle of Absolut vodka. 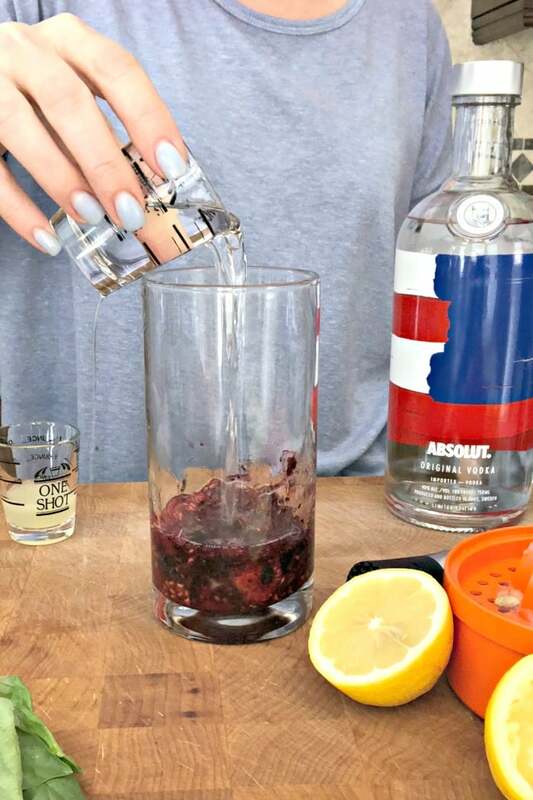 It’s really easy to make Berry Vodka Cocktails. First you add the berries and basil to a tall glass. You don’t need to have a cocktail shaker to make these mixed drinks. And if you want to make several at once, you can use a pitcher to make a batch. Anyway, use an inexpensive muddler or the back of a wooden spoon to crush the fruit and herbs. This brings out the flavors and will turn your beverage a beautiful color. Since I’m not good at estimating the amounts, I use shot glasses to measure out the vodka and fresh lemon juice. I like the ones that have the measurements listed on the side. But if you make a lot of cocktails, feel free to eyeball it. 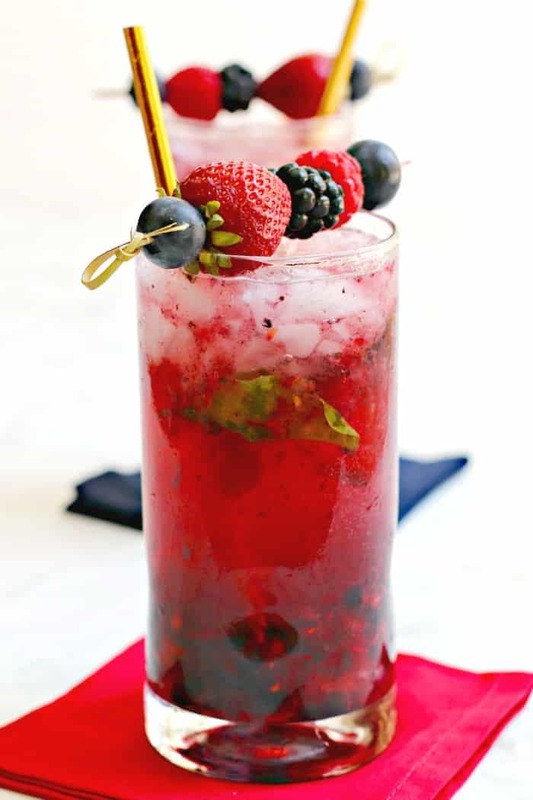 The vodka and lemon juice go into the glass with the muddled berries and basil. Then add as much ice to the glass as you like. I prefer using crushed ice, but ice cubes are fine, too. The last ingredient is club soda. You don’t need to measure the club soda. Just add as much as you like. I prefer to top off my glass since I don’t like overly strong cocktails. But the choice is up to you! Did you notice that I didn’t add any sugar to the drink? 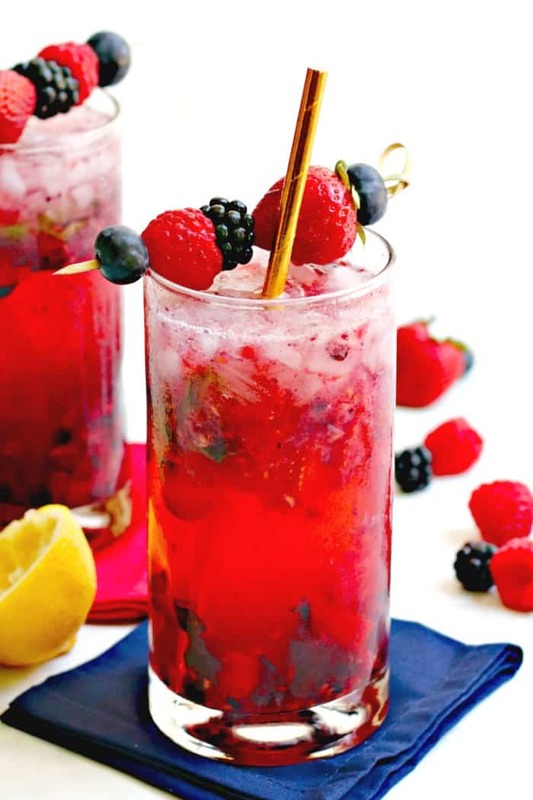 It’s easy to keep these cocktails sugar-free since the fresh berries add just the right amount of sweetness. 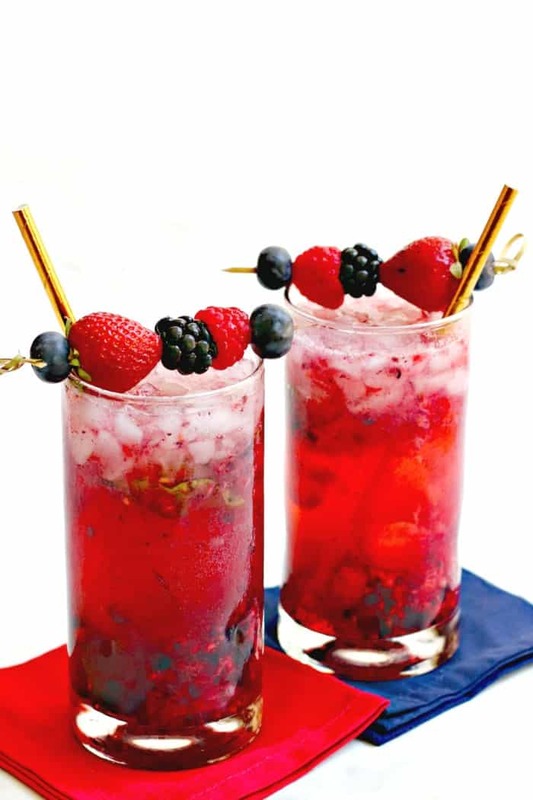 As a result, a berry vodka cocktail is under 150 calories! Berry Vodka Cocktails pair well with all sorts of cuisines. You can serve them at backyard BBQs with Guacamole Veggie Burgers, Curried Potato Salad, and Apricot Crumble. Or try them with BBQ Ranch Chickpea Salad and Cheesy Potato Wedges. I even enjoy them with Orange Tofu and Marinated Asparagus Spears. Not only are these alcoholic beverages delicious, they are also very pretty. 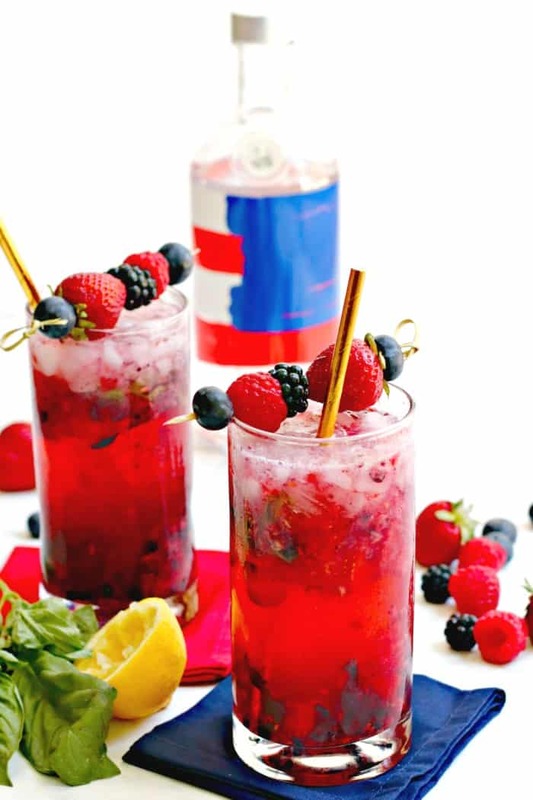 And for those under 21, they are just as festive made without the vodka as a colorful mocktail. Easy Berry Vodka Cocktails are quick to make with only a few ingredients. You don't even need a shaker. 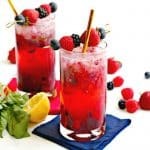 And these festive summer drinks sugar-free. 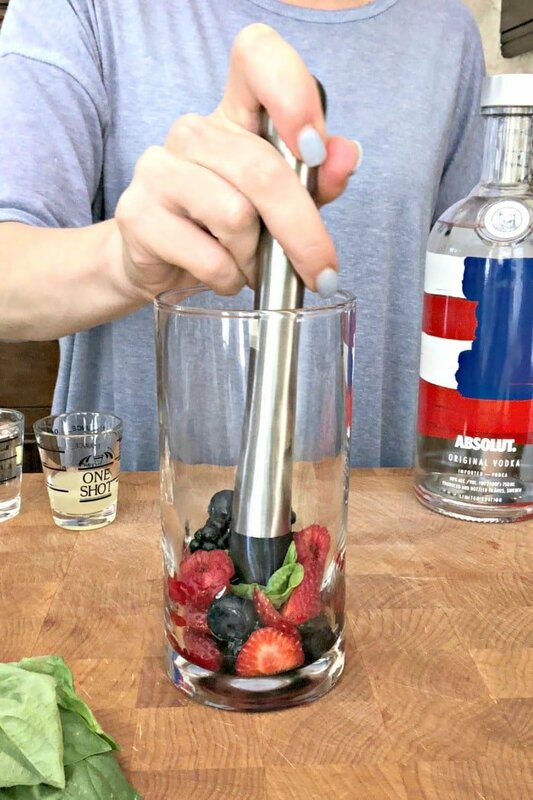 Muddle the berries and basil in a tall glass. Pour in the lemon juice and vodka. Stir and garnish with additional fresh berries, if desired. Enjoy! To make several cocktails at once, use a pitcher instead of glasses for making the cocktails. very refreshing. I did not add the sparkling water because I don’t like carbonation. it was wonderful without it. not too sweet, not too strong, just right. it does leave room for another cocktail which makes me happy. Thank you, Barbara! Happy New Year!